Look! Look! Look! what I won! 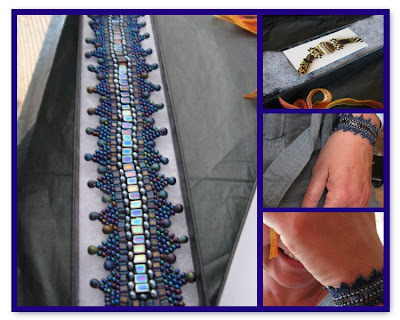 This gorgeous hand-beaded, intricate bracelet is from the talented Lynn in the sacred grove that is Nemeton. Lynn, as you may know, sets confounding riddles in her Treasuries on Etsy. I still can't believe I worked one out. Anyway, my prize arrived today and here I am, wearing it. Outrageous and improbable as this sounds, Lynn also admits to a secret ambition to win the Ugly Necklace Contest for Britain . So, please follow this link and vote to bring the gold back to Dorset.